Everyone knows the fact that one size, be it a t-shirt or shoe, cannot fit all and everybody needs a size tailored to them. The same applies to everything electrical including water heaters that we use to heat water during winter season or even otherwise. Water heaters come in all sizes and shapes, and some are used in the bathroom for shower and some are used in the kitchen to wash dishes. Hot and warm water can be a very effective way of deep cleaning that may not be possible with cold water, especially in a chilly weather. And then, nothing can beat a hot rewarding shower on a cold morning or night. The most commonly recognized and used water heating electrical device is the storage type water heater which you can find in varying sizes, shapes, and capacities ranging from 5 liters to as high as 50 liters, even 100, and beyond. Depending on the application (for home or commercial places like hotels, etc.) you can choose a capacity that suits your needs the best. These storage water heaters also come in different shapes, for example, in both horizontal and vertical configuration. Most of you would be quite familiar with the vertical shaped water heaters that may be in oval, circular or rectangular shape. However, there are many cities and towns in India where the ceiling height of the house including bathroom is very low where a vertical shaped water heater will not easily fit. Even otherwise, some waters have a very slim profile with inlet configurations on either side to suit your bathroom placement. There is another factor that defines water heaters. In high rise buildings, the water pressure is usually very high that normal water heaters cannot withstand and with time, they start leaking and the valves might giveaway. Moreover, the inner parts can be damaged under pressure. Another important feature of any storage type water heater is how fast it can heat water. Depending on your lifestyle, you may be short of time in the morning and need the water to reach its peak temperature quickly. Water heaters are also designed to meet this specific feature. Now that we talked about fast heating of water, retaining that heat for longer period of time is also equally important, which is made possible with technologies like high density PUF insulation. Water quality also varies widely with geography, and some places have hard water that can damage a water heater in a matter of months. A Feroglas coating made of ultra-thick super cold rolled steel plates can be used as a protection against hard water that many regular water heaters fail to provide. 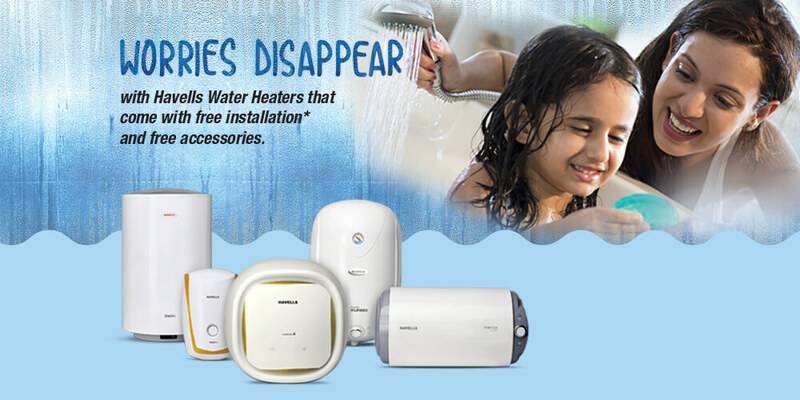 As the name suggests, instant water heaters provide hot water almost instantly without delay. They are very useful for use in kitchen for getting instant hot water for washing dishes and cleaning. Also, in many regions of India, it never gets too cold but at the same time bathing with tap water can be a chilling experience. An instant water heater strikes just about the right balance of not having to own a bulky water heater that takes some time to heat lots of water which you may not require. Instant water heater can provide just the right amount of heated water instantly for you to have a refreshing shower comfortably. There is another type of instant gas water heater that runs on gas instead of electricity. Some cities have pipeline supplied gas that can be used to power this type of instantaneous gas water heater. It is considerably cheaper to operate and provide instant hot water. Solar water heaters are a cost-effective of ensuring consistent supply of hot water without the high electricity bills. With rising power costs and lack continued power supply, solar power ensures that you never run out of a hot shower any time of the day. Some cities get plenty of sunshine and the local power supplier may even provide incentives for switching to solar. Such water heaters that run on the free energy source of sun is a great way of not only saving money but conserve the environment. Havells provides an extensive range of utilitarian yet modern water heaters that offer a host of benefits. To learn about the entire range, click here.